Join the discussion on our forums! Come discuss Swamp Dragon Egg over in our dedicated Swamp Dragon Egg discussion topic. Would you eat them in a ditch? Would you eat them with a witch? Very good for priest . I think it can be in dragon priest. Last expansion, I commented that Hoarding Dragon summarized that expansion's atmosphere in a nutshell. 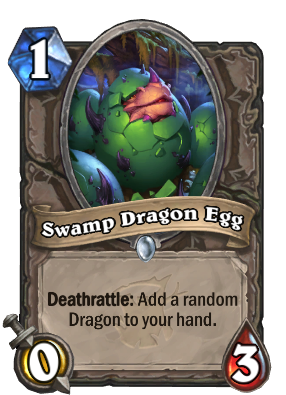 This time, I nominate Swamp Dragon Egg as this expansion's mascot. Deep in the field, there lies an ancient force of unpredictable but potent proportions. It's easy to deny that this force will ever even materialize, but let your guard down at your peril -- the dragon's power will emerge one way or another. Such is the story told by this card; you are aware of the dragon's presence inside the egg, but you don't know when or even if the dragon will emerge on your opponent's field... though when it does, you had better be ready. this... this is okay. but the question is if it'll be good? 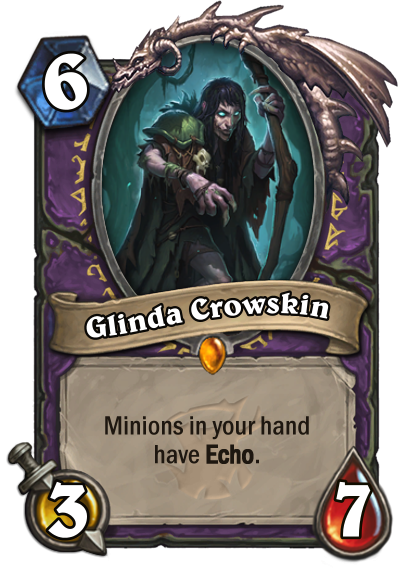 i mean the naxx egg only saw play because it has 2 hp and has an instant board presence when killed.. this is... 1 mana 0/3 do nothing if it doesn't die. i mean you can buff this but then it kinda suffers from the same reason the dragon egg didn't see play... idk.. i really think eggs would be better if they were all stated at 2 hp 3 hp is a little to much for this. the runic egg doesn't even see play and it's technically the exact same thing. Drawing a card is actually better than a random card as you'd knowingly put good cards into your deck. "Behold. The corrupted eggs of our new dragonflight." How are you going to give attack to eggs in dragon priest without making the deck bad? Egg druid in wild is smiling at this card. It doesn't really fit into egg druid. The whole sense of HIS eggs is they spawn a minion(s) immideately. Egg druid isn't interested in an egg that provides value that's why Runic Egg was never really played. One drop, can give you any dragon, can potentially get more out of it, synergizes with several things such as deathrattle and sacrifice effects, allows you to use your one slot for a dragon in a way, is card draw from outside of your deck and doesn't get you closer to fatigue. Lot of legendary ones so you can potentially double up on some or get ones from other classes. I already stated that in the comment. It allows for getting a dragon draw from your first turn, freeing up later turns for more tempo driven ones, you are not using a card to destroy it, you are using IT to pay the sacrificial cost of a card or letting it die as collateral damage to all out aoe such as a turn 6 war weapon aoe or dragonfire, or serve as a part in the defile chain. Not only don't you burn your turn 6 turn's tempo but this once again has much easier ways to synergize with Umbra, Rivendare and other such,. The sacrificial choice being good for aggressive locks by giving them a bit of tempo loss in exchange for some late game power, something they can't do with a 6/5 body for 6 quite as well. This also synergizes with the new extreme inner fire priest, becoming a 3/3 later in the game. Finally, you can run it with said 6/5 dragon as while in some decks it may indeed be a choice, a fair number can benefit from both or one of each. I made an account just to agree with poor Nemaki, this card is really bad. It's extremely slow and needs an activator for such a lacklustre effect. This card would even be below average as a 1 - Place a random dragon in your hand. Just put a dragon into the deck slot this card occupies, and now you didn't have to waste time trying to activate a card in order to have a dragon in your hand... it's already in your hand, and it's a dragon of your choice! Since you went and bothered with making an account for just this do make sure you go and make that statement bout every single ''egg'' card in the game. Might as well after all, right? No, all the other egg cards which saw play offer something better.